Last day of the month sees a couple of major promotions come to an end! Today is the last day to take advantage of the American Express 25% Transfer bonus to British Airways Executive Club. Read more about it here. LAST DAY in our promotion where you can get a $250 Gift Card from Rewards Canada! Find out more here. Cineplex SCENE now has its own bonus points page on Rewards Canada! See it here. 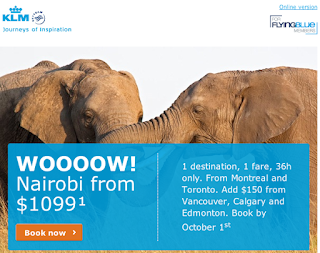 Remember we have an exclusive offer with WestJet that saves you 20% on their Plus fares. You must book by Oct 5! Find out more here! Its Wednesday so that means KLM's Wild on Wednesday is here! Today's offer is for Nairobi Kenya for $1099 all in from the East or $1249 all in from the West. Book by Oct 1 for travel between October 16th and December 10th or between December 24th and May 6th , 2016. Find out more here! 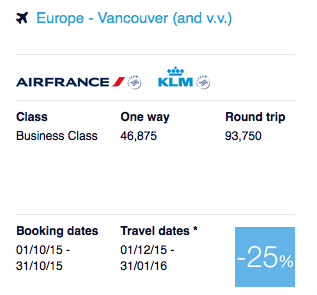 Once again we have some Canadian cities in the latest set Air France KLM's Promo Awards. 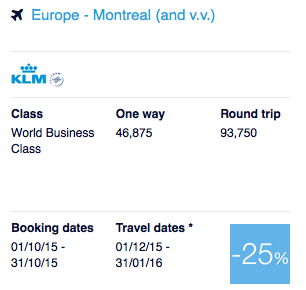 The offer this time is only for 25% off Business Class on KLM out of Montreal or on Air France from Vancouver to anywhere in Europe. For some if you were planning to redeem anyways for flights during the promotional perioed you might as well grab the 25% if it works for you but in general its nothing to write home about! Don't have all the miles? You could always consider transferring Starpoints earned via the Starwood Preferred Guest Credit Card from American Express to Flying Blue. 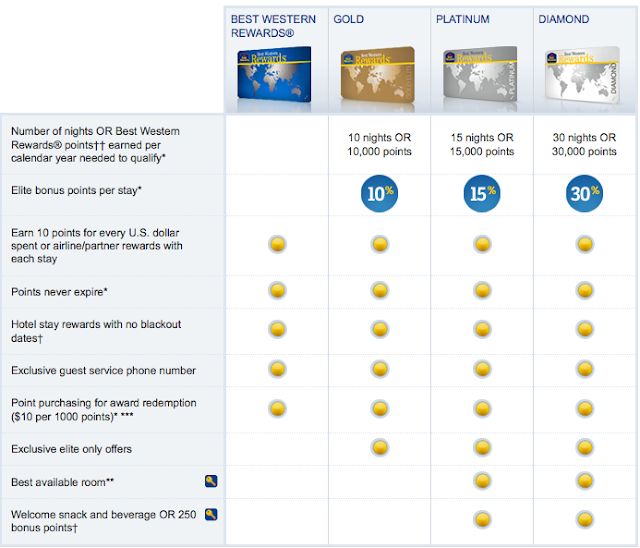 The card has a 20,000 Starpoint bonus right now which translates to 25,000 Flying Blue miles. What are the promo awards? The promo awards are a discount of 25-50% off the regular Flying Blue mileage requirement for select Air France, KLM, Air Europa and Kenya Airways award tickets in select cabins. To take advantage of this deal you must book your promo award ticket by October 31st for travel between December 1st and January 31st. More details can be found here. 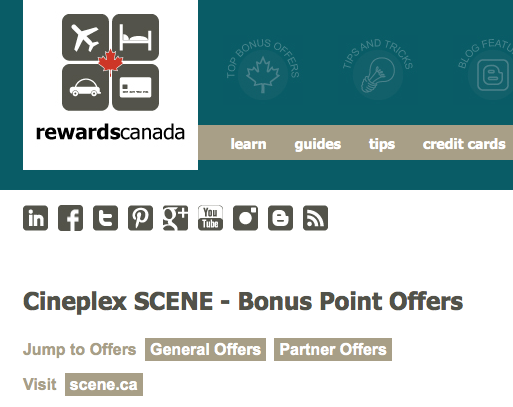 Over a year ago we said that Cineplex's SCENE program was the program to watch out for in our Top Loyalty Currencies feature as they were planning to become more of a competitor to Canada's two big coalition programs AIR MILES and Aeroplan. Well their growth into a coalition program continues with the addition of the Cara group of restaurants as an earn and burn partner. 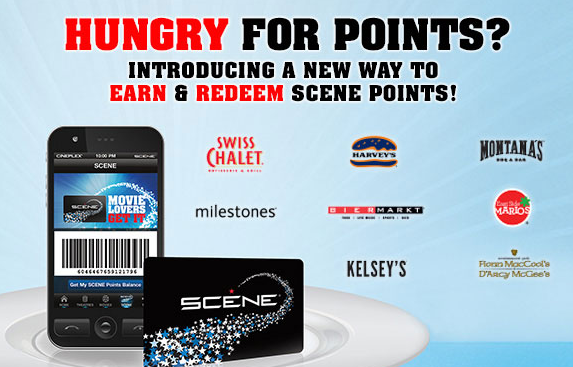 SCENE members will now be able to earn 1 SCENE point for every $3 spentd at 8 restaurant brands across Canada. Members will also be able to redeem 1,000 points for a $10 credit at these restaurants. To celebrate the newest addition to the program you can earn bonus points at these restaurants with these coupons. Learn more about the new partnership here. If you registered for the newest SPG promotion, Stay For More, you may have noticed that after you complete the registration you are taken to a new page on SPG called 'Dashboard'. This new dashboard allows you see tons of great info on your membership with SPG along with special targetted offers such as 200 points for opting in for emails, 500 points for booking via the SPG App or 10,000 points for completing stays at all 10 SPG brands. 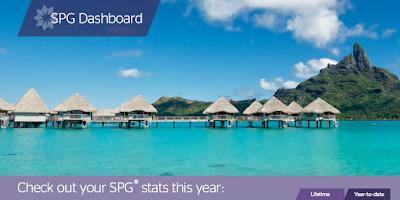 You can access your SPG Dashboard here. Only 2 days left in our promotion where you can get a $250 Gift Card from Rewards Canada! Find out more here. While economists aren't saying that we are in a recession yet there has definitely been a downturn in the Canadian economy and lots of you may be feeling the pinch. There have been thousands of lay offs in the Alberta oil patch alone so how can you go about saving some money but continue to maximize your travel rewards on credit card spending? You could look at adjusting your portfolio to credit cards that carry no annual fee. The great news is some of them provide benefits that rival many fee based cards like the Capital One® Aspire Travel™ Platinum MasterCard®. If you are between jobs because of a lay off or have had to take a pay cut due to current economic situation then you need to look at all aspects of your financial portfolio including credit cards and reward programs. Do you have multiple premium cards with annual fees in your credit card portfolio? If so, you could save yourself several hundred dollars by switching to no fee cards for some or all of them while continuing to build up your rewards balance for the time when your own situation improves to start vacationing again! Every year we release our Top Travel Rewards Credit Card rankings and one category is no fee travel points cards. The first four from this past March haven't changed and are listed below. However the 5th place card, the CAA Rewards MasterCard underwent changes and the no fee version is no longer a top 5 contender. • New Blue Sky® Credit Card Cardmembers, earn 10,000 Blue Sky® Points after you charge $500 in purchases to your Card in your first three months of Cardmembership. • Enjoy the convenience of no blackout dates, no advance purchase requirements, no seat restrictions and no travel restrictions. • Earn reward miles – with no annual fee! New American Express AIR MILES Credit Card Cardmembers, earn a bonus of 500 AIR MILES®* reward miles the first time you use an approved Card. 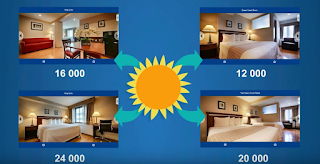 You can also look into several travel cards which are first year free, these typically earn a lot more points than those above and have greater benefits. You can then decide just before the anniversary of the card whether to keep them or not so you do or don't pay the annual fee on them. • New American Express AIR MILES Platinum Credit Card Cardmembers, earn a bonus of 2,000 AIR MILES reward miles when you charge a total of $500 in purchases to your Card within your first three months of Cardmembership. Full details of the partnership aren't out yet so we don't know the earn levels yet. Those will be revealed when the partnership launches. As a Toyota owner I'm excited as I will now have yet another way to earn more miles however I wonder if this will make my local dealership's reward program disappear or at the very least have to choose between one or the other. Hope everyone had a great weekend! Here is your first update of the week! 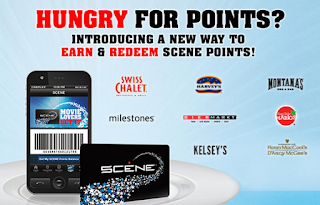 If you visited the main Rewards Canada site over the weekend you may have noticed a change to our menus! We have essentially run on the same menu system for 10+ years which was fromed when Rewards Canada had a larger focus on bonus offers and not much other content. For many years we have been providing much more content than bonuses and the menus did not follow so it was hard to find our features, guides, educational pieces and more on the site. Now with the new menus it should be much easier to find all we have to offer on the site! There is still further updating to be done to the drop down menus however so be sure to keep checking them as they will change over time! 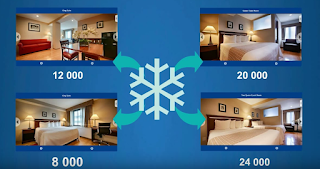 There is a great new increased sign up bonus for the Best Western MasterCard from mbna! The usual bonus of 20,000 points has been doubled to 40,000! Not as big as the 50k we've seen in previous years but still a great offer to take advantage of seeing that the card has no annual fee! Find out more here. Only 3 days left in our promotion where you can get a $250 Gift Card from Rewards Canada! Find out more here. The changes to the Elite status levels of BW Rewards see the addition of a fourth top tie level called Diamond Select. This level will require 50+ nights or 40+ stays or 50,000 base points from stays to achieve. 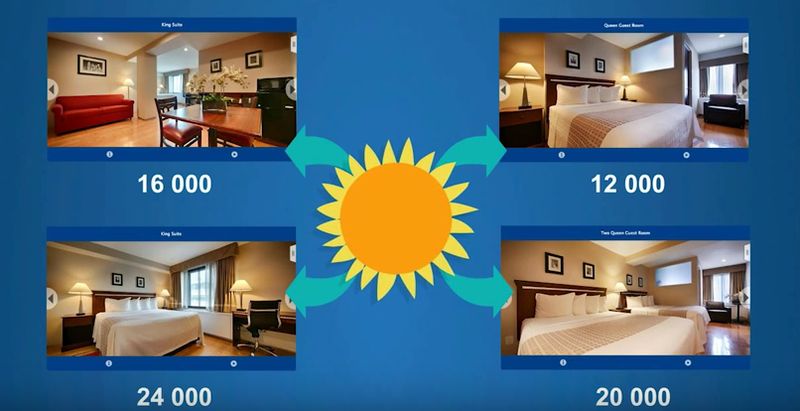 This new level will receive 50% elite bonus points on each stay once achieved. 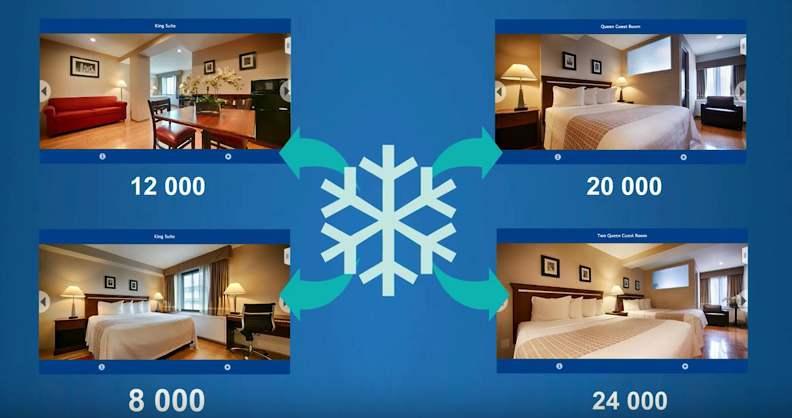 All Platinum and higher levels including Diamond Seleect can receive room upgrades depending on availability however at this time we don't know what other benefits will come with Diamond Select other than the 50% bonus points. As we learn more details of the changes we'll be sure to let you all know! In the mean time feel free to comment below to let us know what you think of the changes that we know so far!